Figure 4.32. Gross weight decreases significantly as weight ratio decreases. Operational weight empty is almost constant. shown, as the Air Augmented rocket is at a mass ratio of 7.5 and heavier than the allrocket. Below that point, the OWE value is on top of the correlation line indicating a heavier empty weight. The ram rocket, in which the oxygen in the ejector secondary air is burned, is a different case and the weight and oxidizer-to-fuel are less than the all-rocket. The ram rocket has a gross weight similar to the PDE. The difference is the ram rocket is at the end of its improvement capability while the PDE is just at the beginning of its potential improvement cycle. The pulse detonation rocket (PDR) has a gross weight similar to the ram rocket, with much less complexity. The important result is that either can reduce the gross weight by 200 metric tons! This is comparable to the highest values of the airbreathing rockets and the KLIN cycle. So the incorporation of some airbreathing in the rocket, whether an ejector burning fuel in the secondary air stream (ram rocket) or by direct airbreathing rocket (LACE, deeply cooled rocket or KLIN cycle) results in a significant advantage in gross liftoff weight and engine size and thrust reduction (28% reduction). 300 metric ton range. As shown in Figure 3.3, as the airbreathing speed is increased, both the oxidizer-to-fuel ratio and mass ratio decrease. As Mach 12 airbreathing speed is reached, further increases in airbreathing speed do not result in additional decreases in the mass ratio. This results from the fact that, as shown in equation (4.11), both the thrust and specific impulse for an airbreathing system are decreasing inversely proportional to speed and the drag could be increasing. When the effective specific impulse (based on thrust minus drag) falls below the effective specific impulse of a rocket, the rocket is a better accelerator. So attempting to fly to orbital speed with an airbreather will result in a larger vehicle that requires more propellant. Air collection, enrichment and separation (ACES) began being recommended for TSTO launcher. As discussed in Chapter 2 and later in the chapter, for that application the ACES has significant advantages. However, for SSTO the added volume in the orbital vehicle can have penalties, depending on the system design. Even though the ACES has both a lower weight ratio and oxidizer-to-fuel ratio, its gross weight is about the same as the ejector ram-scramjet and the scram-LACE and scram-deeply cooled. In both plots, the OWE is heavier than the correlation line, as was the air augmented rocket. What does fall below the OWE correlation line are the PDE points. That is for two reasons: less volume required and lower-weight propellant pumping systems. In Figure 4.32 it is almost possible to envision a new main sequence of PDEs parallel and lower than the continuous operation engines. As this class of engine is developed into operational systems the potential exists for this class to reduce both rocket and airbreathing classes in gross and empty weight. What is not clear is whether the cyclic engine can have the equivalent to the airbreathing rocket and its ACES derivative. These latter engines may remain as continuous operations engine cycles only. If we take the OWE results and subtract the 7-ton payload to yield the OEW, then it is possible to see how volume affects the magnitude of the empty weight. Figure 4.33 shows the empty weight value as a function of the total vehicle volume. The correlation is rather good. First notice that the triangles representing the ACES propulsion system have almost the largest volumes. The largest is the air augmented rocket. This clearly explains the OWE values in the previous two graphs where the OWE values were greater than the correlation curve through the other cycles. It is also clear that the PDEs have some of the lowest volume values for the propulsion systems presented. So the variation in empty weight can primarily be explained by variation in total volume. The OEW is also a function of the structural index and the weight ratio to orbit (Figure 4.32). As given in equation (4.19), the mean OEW for any other structural index than the VDK CURRENT at 21.0 kg/m2 and any mass ratio can be determined. Representing the data in Figure 4.32 in terms of total volume rather than weight, results in Figure 4.34. Clearly the ACES lies above the main sequence of propulsion systems (large shaded area) and the PDEs lie below the main sequence of propulsion systems. 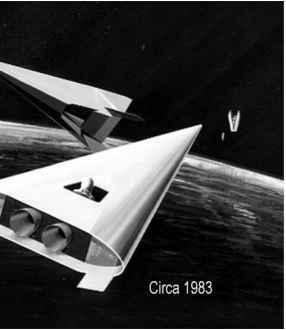 Whether the PDE-ramjet and PDE-scramjet areas can be connected remains to be seen, but there should be no technical reason why future PDE systems would not span that area.